The date is almost upon us, when we open up our Pre-Oscar Party support campaign, which includes tickets to attend ‘The One Last Party: There and Back Again” on Saturday, February 21, 2015. The Campaign will be going live tomorrow on Indiegogo and will include numerous levels of support, including cost saving levels for those who can’t attend but would still like to support TheOneRing.net as we say One Last Goodbye to all things Middle-earth on the big screen. In the first of a series of Scrapbook articles, we will be looking at brief moments from previous parties, some from the planning phase, the production phase, or reviews from fellow fans who have attended. While digging through some of our old photos, I came across something a little different. 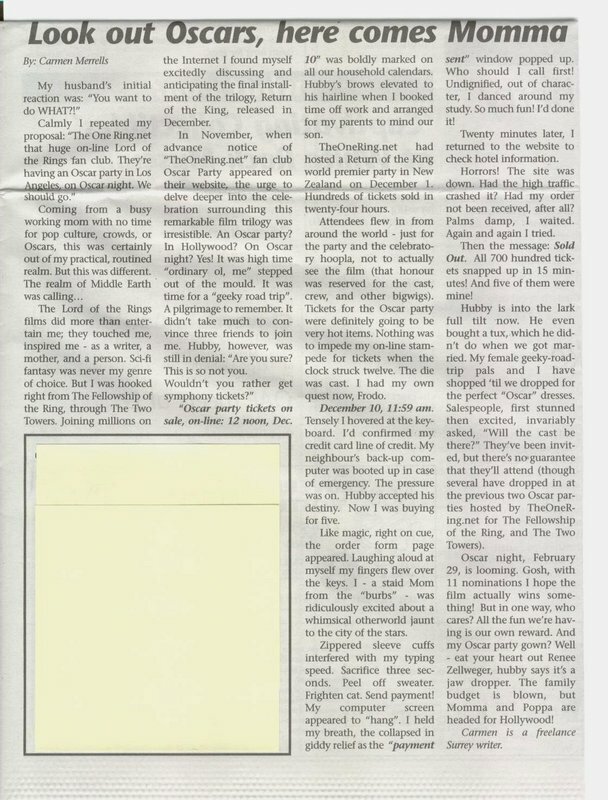 This was a story written in a small town paper by a woman who had decided to try and attend our Return of the One Party in 2004 and conveys her excitement at the prospect. With the tickets and support page opening up tomorrow, this seemed a very appropriate Scrapbook reminder. You can read her story from this below.